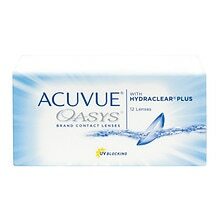 Important information for contact lens wearers: ACUVUE® Brand Contact Lenses are available by prescription only for vision correction. An eye care professional will determine whether contact lenses are right for you. Although rare, serious eye problems can develop while wearing contact lenses. To help avoid these problems, follow the wear and replacement schedule and the lens care instructions provided by your eye doctor. Do not wear contact lenses if you have an eye infection, or experience eye discomfort, excessive tearing, vision changes, redness or other eye problems. If one of these conditions occurs, remove the lens and contact your eye doctor immediately. ‡UV blocking percentages are based on an average across the wavelength spectrum. 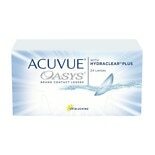 ‡Helps protect against transmission of harmful UV radiation to the cornea and into the eye. For safe and comfortable contact lens wear, lenses should be cared for according to the schedule recommended by your eye care professional. Always wash your hands before handling your contacts. Daily disposables require no lens cleaning, just start with a fresh pair. How do I put in my contact lenses? STEP 1: Thoroughly wash and dry your hands with soap and a clean towel. STEP 2: Rinse your lens with solution to remove any trace of debris. Tip: To avoid mixing up your contact lenses, always apply and remove the lens for your RIGHT eye first. STEP 3: Place the lens on the tip of your index finger. Be sure the lens is correctly oriented by checking the inside–out marker. STEP 4: Use your other hand to hold your upper eyelid so you won’t blink. STEP 5: Pull down your lower eyelid with the other fingers of your applying hand. STEP 6: Look up at the ceiling and gently place the lens on the lower part of your eye. STEP 7: Slowly release your eyelid and close your eye for a moment. STEP 8: Blink several times to center the lens. You're all set. STEP 9: If your lens feels uncomfortable, remove it and inspect for damage or debris. If it’s damaged, discard it. Otherwise, rinse with more solution and reapply. How do I take out my contact lenses? STEP 2: Look up at the ceiling and pull down your lower eyelid. Tip: To avoid mixing up your contact lenses, always apply (and remove) them in the same order. STEP 3: Bring your index finger close to your eye until you touch the lower edge of the lens. STEP 4: Slide the lens down to the lower white part of your eye. STEP 5: Gently squeeze the lens between your thumb and index finger and remove it. STEP 6: Remove the other lens following the same procedure.